A good printer understands the fluctuating, fast-paced nature of the retail industry. You need your printer to be flexible because markets shift, you have to move inventory, and suddenly you need your promo material yesterday. Some things are out of your hands. What can you control? There are indeed steps you can take to curb costs and reduce the confusion when it comes to ordering store signage. Here are our best practices to help you plan ahead—your printer will thank you! 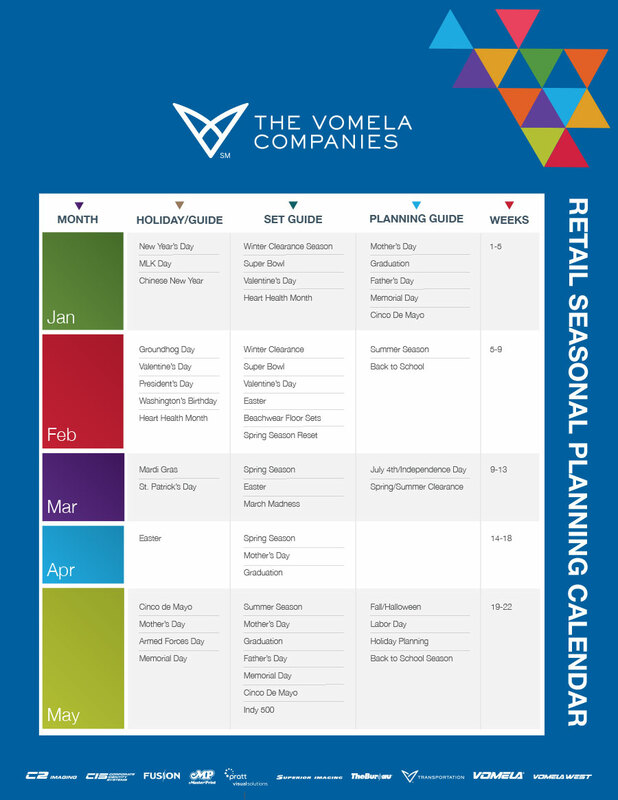 A Seasonal Planning Guide can help organize the advanced planning required for procuring the POP campaigns and promotional materials you need for the seasons and holidays relevant to your business. In our sample, the fiscal year begins January 1. Of course, if your fiscal year starts at a different point in the calendar, you should modify it accordingly. Many businesses market on a seasonal basis; you've seen the signage encouraging patrons to prepare for spring, summer, fall and winter, with graphics appropriate to each season. You want to be prepared to set out your store's decor for each season, including Back to School events in the late summer/early fall, or the clearance events that clear the way for the next season's wares. This signage tends to stick around for awhile, so this is the place to splurge a bit on higher-quality, durable materials. Most months have at least one holiday that retailers use as an opportunity for special sales; the signage that goes with Mother's Day, Independence Day, or Columbus Day is familiar to anyone who's visited a retail store in May, July, or October. 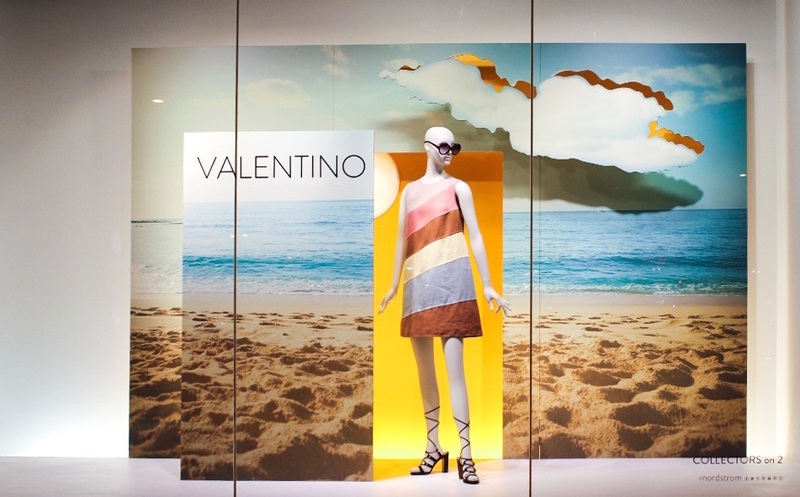 These are typically shorter-lived displays, but they're necessary parts of your marketing calendar. Then, there are the major holidays, like Christmas, Halloween, or Easter. Christmas displays in particular come earlier every year, so you want to have all of your printing needs planned out and executed in time to set up the displays that welcome one of retail's busiest times. This refers to special events, such as Breast Cancer Awareness Month or the Red Dress campaign in honor of heart health; these observances are sometimes used to promote a cause and raise money to help. There's also potential in events that are specific to your location, so it's smart to do a little research to see if there's any cause for celebration in your community that you can parlay into an opportunity for creative marketing, with help from your printing partner. Request a Kit – When you're ordering from your printer, request that they put all the materials from two upcoming campaigns in the same shipment; this saves on shipping, and you're ahead of the game. However, we do caution you not to get too far ahead of yourself. Signs can get damaged or go missing when they sit around unused. Multi-Purpose Signs – You can request double-sided signage from your printer; whether it's a refresh of your seasonal campaign or an entirely new campaign, flipping the sign is easier and cheaper than ordering a whole new set. Be Prepared – It's not just a Boy Scout motto, it's the best way to keep your printing budget in line. If you've got your marketing material order placed well in advance, you will save yourself the last-minute shipping charges that can break your budget. Stay Flexible – Being willing to make your signs even an inch or two smaller can allow your printer to put two signs on the same page, reducing your printing costs. Flexibility about the materials used for your signs can be a source of savings, too. If you know the sign is only going to be up for a few days, it doesn't make sense to use a high-priced extra durable material. Something thinner can look just as nice and save some cash. Consult your printing rep—explain how you want to use the sign, and ask for recommendations about the best material for the job. Actions Have (Financial) Consequences – Understand that if you choose to move a campaign up, or to create signs to generate new interest in flagging sales, you'll be paying a premium on getting your signs ASAP. Overnight shipping and other costs for rush jobs can quickly add up. Are you ready to take control of your printing projects? Do you want to stay on budget and eliminate marketing chaos? Get started by downloading our Seasonal Planning Guide!